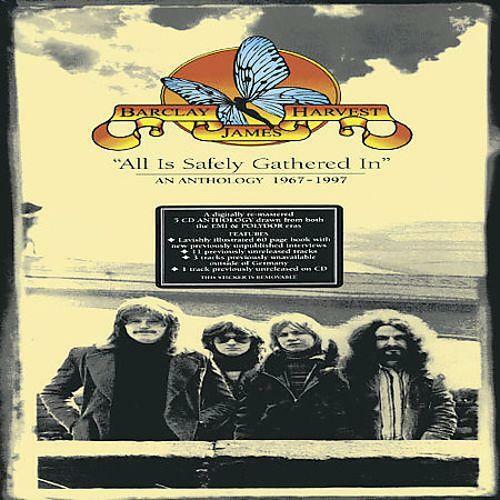 Barclay James Harvest - "All Is Safely Gathered In"
In the 70s BARCLAY JAMES HARVEST was one of the most popular bands in Europe. Hits like "Hymn", "Mockingbird" or "Berlin" are unforgotten. And now, the five men from Great Britain present an ultimate goody to their fans: a 5-CD Box with an unbelievable 6 hours total playing time, named "All Is Safely Gathered In – An Anthology 1967 – 1997". Beside of all their relevant hits, the box contains eleven unreleased tracks, three songs not yet published in Germany as well as one track that hasn't been available on CD before. Plus, this Deluxe-Box-Set comes with an 80 (!) page booklet, wherein the BARCLAY JAMES HARVEST-Story is written in the words of John Lees, Stuart „Wolly“ Wolstenhome, Les Holroyd and Mel Pritchard, who died after a tour in 2004.